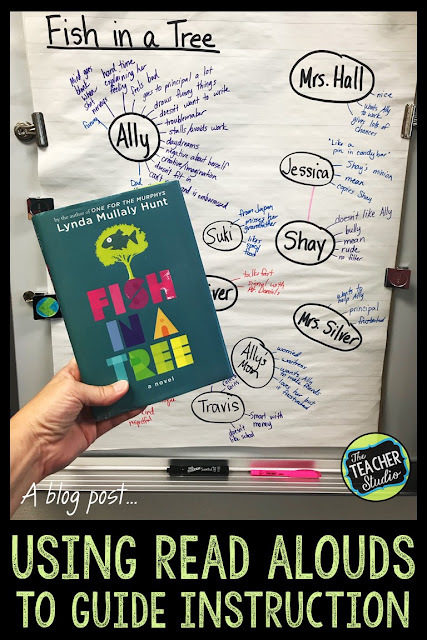 For me, “Fish in a Tree” is an amazing choice for a mentor text when we do our narrative unit because we want our students to “read like writers” and “write like readers” so we really intertwine our reading and writing work. We study narratives that we read and then take what we notice and apply those skills to our own narratives. That being said, I truly feel our read alouds should NOT be destroyed by making students do tons and tons of work…there is something to be said for simply enjoying a beautiful text. For that reason, I am very judicious about what I do to supplement my novels. I’ve shared a few quick and easy ideas that you might want to consider to gently “use” these great novels to supplement your teaching. Because today is my day to blog over at Upper Elementary Snapshots, I hope you’ll stop over to check out some of the lesson ideas I am sharing to use with whatever read aloud YOU are using right now! Just CLICK HERE or the image above to take you there! Want to check out my Fish in a Tree novel study? Just CLICK HERE!